References to several of my families go back quite a ways beyond the British Isles and into France: The Percys (Pearces) and the Croys (Grays) , for example. Most of these claims are associated, whether correctly or not, with the Norman conquest of the Isles by William in 1066. But one line on my father’s maternal side, while not going back that far, is much more convincing, with specific names, dates, and locations—the Jack family, which is Jacques in French or James in Dutch—dating to 1393. The connection began with the 1783 marriage of Mary Jane Jack (b.1749) to John Cooper (b.1751) in Newton Township, Cumberland County, PA. She lived her entire life there, passing at the age of 72. Mary Jane and John’s daughter Margaret (b.1787) married Lawrence Carlysle Fleming (b.1784) and they moved to the region of the world’s first oil boom, Venango County, PA. But some of Mary Jane’s earlier family moved south, taking the Great Wagon Road south to the Carolinas and at least one became a household name in those parts. In this article we’ll look at her ancestors and the directions their lives took, from France to Scotland, to Northern Ireland, to America. How did the name go from James to Jacques to Jack? Let’s begin by exploring the somewhat confusing origins of the name and some famous persons who have carried it. First of all, an inaccuracy: our surname “Jack” actually comes from the Medieval moniker “Jankin,” which, according to Wikipedia, is “strictly a diminutive of “John,” or “Jean” in French, not “Jaques.” I’ve written about this name before in a piece called “Clearing up Confusion over Names: John & Jack.” Nevertheless, our ancestral records show that sometime after 1559, when the children of Jacob James (b.1496) and wife Sara moved from The Netherlands to France, their surname became translated “Jaques,” or “Jacques.” Then, it was changed again, this time to the Anglicized “Jack,” around 1650 after Guillaume, Jr. (b.1630) married Jeanne and they moved to Scotland with at least part of their mid-sized family already in tow. By the way, Guillaume was Anglicized to “William.” From there the entire choice of names seems to be used interchangeably by historians and genealogists either through confusion or uncertainty among the record keepers. The great irony is that “Jacques,” the French equivalent of “James,” is the derivative of “Iacobus,” or “Jacob” (the I and the J here pronounced as a Y), from the Greek. Jacob and James, of course, come from the Bible. In Hebrew, Jacob means “heel,” a reference to the twin of Esau who held onto his brother’s leg at birth. Sometimes, the name has a negative connotation, as in “deceiver,” because of the trick Jacob played on his brother to get father Isaac’s inheritance. In the New Testament, James was the brother of Jesus. So, in summary, Jaques (or the better known Jacques with a “C”), James, and Jack in this case all refer to the same family. Was there confusion or were the record keepers and genealogists listing all the possible translations to be on the safe side? You decide. We’ll get more into our family line in a moment, but now let’s consider some famous users of these names. There are too many to list here, but suffice it to say that persons with Jacques as a last name include an actress, a hockey player, a politician, and several writers. Of course, the most famous person using Jacques as a first name was French underwater explorer Cousteau (1910-1997) . Let’s not forget former first lady Jacqueline (in the diminutive) Onassis (1929-1994) , whose first mate was—John “Jack” Kennedy. Most of the rest were athletes, artists, or politicians. Plenty of fictional characters exist in song and prose, also. James has been the most popular name in the British Isles over the years, probably owing to the various kings. That popularity certainly carried over to the United States with an equivalent from every culture added to the melting pot. The same is certainly true of Jack, with page after page of examples on websites devoted to names. We suggest a search of Wikipedia.com to start, if you’re interested. Little is known of the first two generations of our Jacks in Europe, except through later wills and marriage contracts, but notes on Jacob James (b.1496) say that he was born in Utrecht, The Netherlands. His wife Sara’s (b.1502) last name certainly indicates that she was Dutch—VanHaestrecht. Their son Jacobus (b.1528) traveled to England in 1558, for whatever reason, before marrying his French bride Corrine and settling in Eure-et-Loire. The next three generations were born in France, but as we said above, Guillaume Jaques, Jr. (b.1630) moved to Edinburgh, Scotland, sometime before he died and two generations of Guillaumes’ became anglicized to “William Jack.” The second one was ordained into the ministry and served at the Bull Alley Presbyterian Church in Dublin, Ireland. Many Scots “moved to Ireland to escape religious persecution,” but under the reign of King Charles II he and twelve other ministers of the Presbytery of Lagan were “ejected from their benefices or livings for their non-conformity to the Church of England.” Quite a bit has been written on this and other persecutions. Research continues for more specifics on the Rev. William Jack. [Patrick] James Jack was Captain of the Militia of North of Ireland in County Down at the time of the persecution of the Protestants, and the Catholics were very bitter against him by reason of his marshalling the militia against them. After the wars had quieted down, he went back to his old home in Scotland and later returned to Ireland. The family narrative continues with Captain Jack finding that his land in Ireland had been maintained by a young Catholic man named Patrick O’Reily, who apparently would take no payment for the upkeep. Having no family, O’Reily simply requested that the good Captain name his son Patrick, after him. Patrick James agreed and furthermore, promised to “use his influence to have it continued in future generations.” Patrick James did name a son Patrick, but it was son James and grandson James, Jr., from whom we descend. Look for more stories of our Jack family from J.V. Thompson in future articles. Though James, Sr. married Elizabeth McNulty in about 1725 and lived the rest of their lives in the Tyrone County village of Ardstraw, Northern Ireland, we believe that father Patrick James (b.1678) and wife Eleanor, who had married in Londonderry Co., NI, around 1699, may have left some of their older children behind and came to America without them. Some records indicate that they produced children on both sides of the pond and died in Chester Co, PA, in their late 40s. We believe that Our Patrick was the great-grandfather of our Mary Jane Jack mentioned in the introduction above. Patrick’s next two generations of James Jacks became known for their bravery in both the French & Indian and Revolutionary Wars. Captain James, Jr., died fighting in the American Revolution, and we have a copy of his Last Will and Testament. Tradition has it that one of our great uncles, Jeremiah Jack (1689-1785), brother to Patrick James, came to Pennsylvania from Scotland and built a cabin near the confluence of the Potomac and Conococheague Rivers. Not long after a battle ensued between the Delaware and the Catawba tribes nearby. All but one of the Catawba were killed. Not only did Jeremiah provide shelter for the survivor but he talked the Delaware into sparing the Catawba’s life if he would return to his tribe and report what had happened to their enemies. We have record of a Jack family sailing out of Belfast in 1736, aboard the Paoli. This family shows up on public records in Chester County, near Philadelphia, and Chambersburg, along the Great Wagon Road. By 1760, some of these Jacks had emigrated from Chambersburg south to the Charlotte, NC. Check the Documentation below for detailed histories by Foote and Hunter of the southern Jack family. 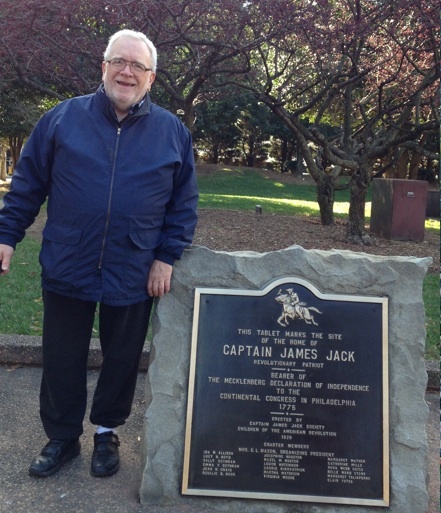 It was another Captain James Jack, our distant cousin, son of Patrick, Jr., our James’ brother, who delivered the famous “Mechlenburg Declaration of Independence” (“Mec Dec”) to the Colonial Congress in Philadelphia in 1775 on horseback. He had it tucked in on of his boots. Below is a photo of me at the site of this Capt. James Jack’s house in Charlotte. In another tale of bravery, John Jack, another grandson of Patrick, Sr. and brother of the Mechlenburg Captain James, apparently saved the lives of women and children on the Pennsylvania frontier in Westmoreland County’s new seat called Hannastown. In the final days (1782) of the American Revolution, the British had commissioned the Indians to destroy everything there. Read about the leader of this raid, Guyasuta, in my article entitled “Meet Native American Guyasuta.” John is also given credit for writing a major portion of what’s know as the “Hanna’s Town Resolves,” a document very similar to the Mechlenburg Declaration. Another Jack, Captain Matthew was also the sheriff of this frontier outpost. He was responsible for saving many lives as he rode to warn the settlers of the impending disaster. The only thing that remains in modern day Hannastown is an historical center, well worth visiting I might add if for nothing else than seeing an exhibit called “The Jack’s Bedroom.” The county seat was moved after the attack and burning to a spot, present day Greensburg, donated by another relative, William Jack, one of the wealthy judges of the county a the time. In conclusion, knowing that information exists pertaining to our Jack family, reaching as far back as the 14th century, I feel that I can finally compete with my wife Susan’s Swiss-German Anabaptists, whose published genealogies and tales of persecution by the Church-States of those days go back into the 16th century. These Amish-Mennonite not only had fascinating stories to tell of their quest for religious and political freedom, but they kept relatively clear and concise records of their ancestors. One might ask why a particular people such as these kept the biblical genealogical practices alive while so many of my ancestors from the British Isles seemed not to care. My present theory is that most in the Ulster plantations and on the Pennsylvania frontier were concerned primarily with their survival and few had the educational skills to keep such records, i.e. they probably couldn’t read or write very well before the coming of the American public school movement. Yet some, like our Jacks, who can boast of national heroes, have surely inspired those within the family and others to do the research necessary to support a rich and full genealogical history. Hopefully, future generations will continue in this tradition. See also Our Jack Family Tree and the various generational Vitals documentation. Thank you so much for sharing. I, too, am descended from the Jack (Jacques) through the Marriage of Elizabeth Jack to James William Kilgore. The most amazing coincidence is the story of Capt. Jack and Patrick O’Reily. Long before I began to do ancestry or ever heard of Capt. Jack, I gave my son the middle name of Patrick! So the name continues as promised. We had a totally different name and decided in hospital to change it adding Patrick. At present I am filling in the Family Tree Maker to share with the Historical Society in Grundy County, TN. Many of the Kilgore family settled there and many descendents still live in the state. Indeed! There are many heroic actions by the Jack and Kilgore families. May the journey continue with much success. It becomes addictive after a few finds and the excitment keeps building. Best wishes as the search continues. Just checking the info I have. I have a Copy of the Will by James William Kilgore and James Jack was one of those present when it was signed. It states ( for James Kilgore) 19 children— 18 were sons and 9 served in the American Revolution. I am descended from Jeremiah Jack 1700 -1785. He is the son of Patrick Jack and Eleanor of Chester County, PA.. Jeremiah Jack’s son, John Jack, was killed by the Indians in 1757 on the Potomac River near Williamsport, Maryland when his father Jeremiah was taken captive for 9 years. John’s son was Jeremiah Jack Sr. of Knoxville, TN. His son Jeremiah Jack Jr. left TN and went to Sedalia, Pettis County, Mo in 1836. When he was 60 and his wife Susannah McCallie Davis 65, they took their children and grandchildren and herd of cattle on the Oregon Trail in 1847 to the Willamette Valley, Oregon, where they received land donation claims on Butte Creek near Mount Angel and Silverton. They were the oldest couple in their wagon party and spent 6 months traveling to Oregon. Their son Thomas Porterfield Jack went to the California Gold rush in 1848 and then returned to his farm in Oregon. His son, my grandfather, is Devalcus Davis Jack who had a farm near Gresham, Oregon near Portland. His son, Cecil Clinton Jack, is my father born in Pleasant Home, Oregon. He farmed for a while and then became a lumberjack, owned a fishing boat in Bellingham, Washington, served as a sergeant in World War II, and after the war became a repairman for Western Union, repairing lines along the railways in Oregon. He used a handcar riding the tracks. He met my mother in Portland. She was a school teacher from Bennington, Vermont. In 1920 they moved to Los Angeles where I was born. My father then worked for Pacific Telephone and Telegraph. I live in San Gabriel, California. The San Gabriel California Mission was founded in 1771. It is the mother of Los Angeles. I also appreciate the info you’ve provided here. I was able to verify much of it through sources available on Ancestry. I am descended from both Guillaumes through Jacob Jacques, his son Patrick, and James Jack and his son John who fought in the American Revolutionary War – all the way down through my paternal grandfather’s mother, Della Sarah Ellis (1867 – 1944). Interesting fact: Patrick’s wife was Eleanor (Elinor) Elizabeth Jarvis (or Jervis) . . . her 4x great grand-daughter (my great grandmother) Della Sarah Ellis married Elmer Parker Jarvis in 1886 in Morning Sun, Louisa County, Iowa. I am dying to discover whether or not I can trace the Jarvis line back to Eleanor Jarvis Jack! (b. 1705 Ballykelly, Derry, Ireland– d. 1780 Cumberland County, Pennsylvania, USA) was very probably deported to the Americas as a “convict” sometime in 1769, after having fought as a Captain in Northern Ireland Militia, County Down, at the time of persecution of Protestants by Roman Catholics. He appears on a US/Canada Immigration List index in 1769 as a “convict” and is listed as an “inmate” in 1770 US Census records in East Caln, Chester County, Pennsylvania.